It had just gone 5h30 when I donned my gloves and switched my head torch on. The trail led into the rainforest at a steep angle, and almost immediately my heart started pounding from exertion. Hundreds of little bugs were drawn to the silvery beam of light that showed the way, and I spat and spluttered with every step, as they found their way down my throat. 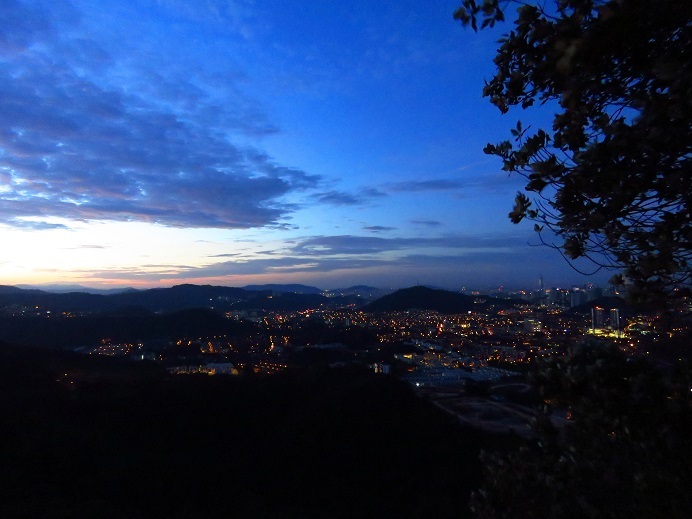 When I looked for interesting things do in Kuala Lumpur, the words “exhilarating sunrise hike” immediately caught my attention. It was a no brainer. I love hiking. I love sunrises. I love experiences that are slightly off the beaten track. And as I was planning to do a lot of eating while in KL, I thought that engaging in a physical activity would be the perfect counterweight. I glanced at the reviews which were full of praise for Casey who led these hikes, but neglected to do any in-depth reading or further research. I didn’t even pay attention to where I would be hiking. The fact that the reward was a 360 ° view of the surroundings, which included a breathtaking view of KL, was enough for me to sign up. 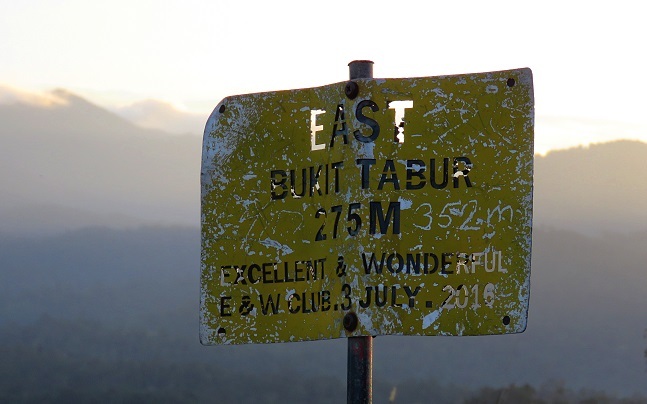 It turned out that it was a good thing I didn’t read too much about hiking Bukit Tabur East (also known as Misty Hill), as I don’t think I would have signed up if I knew that it involved climbing as well. But so much of what we do and experience depends on the state of our minds, and on that January morning my ‘ignorance’ was definitely ‘bliss’. I did what I usually do in these situations, and simply focused on each step and breath. Casey gently adjusted his pace to mine, chattered away, cautioned at tricky spots, and generally made me feel as if climbing Bukit Tabur was more like a gentle stroll than a tough hike. I felt grateful for my regular Yin Yoga practice, which has taught me to acknowledge a challenge, accept it, and relax into it. At every stop where we could catch a glimpse of the flickering lights of KL, and enjoy the gift of a cooling breeze, I was glad I didn’t know what was coming. A bit like life really. If we know which challenges await us in advance, we will be overwhelmed by a kaleidoscope of emotions and fears that will incapacitate us. When we reached the final challenge, I didn’t allow myself any time to think. The almost sheer rock wall with ropes dangling from it could easily have awakened that horrible little voice that so often tell me what can go wrong. Or worse still. I could have allowed my mind to play on my fears and perceived limitations. Instead I focused on Casey’s voice, made sure every foot was secure and steady before I pushed up, and before long I was standing on what felt, in that moment, like the top of the world. In front of me KL was a mass of blinking lights. Towards the east the sky was starting to split in two. And behind me the Klang Gates Dam shimmered in the growing light. I felt elated and charmed. And grateful that I didn’t know what I was letting myself into, as it turned out to be the highlight of my trip. ** Although research is an integral part of travelling, I think it is good to steer away from obsessively reading reviews. They often tend to create unrealistic expectations, and the one thing I’ve learned to avoid when I travel is to steer clear of expectations, because one is bound to be disappointed. Not having any expectations has almost always resulted in a sense of awe and wonder, and on those occasions when experiences have failed to enchant me, they were simply filed in my emotional folder as ‘interesting’. ** It took us 3 hours from when we left, until we returned to the car. The return path is much shorter, and takes only about 30 minutes, but it is steep, and can be very slippery if it has rained. 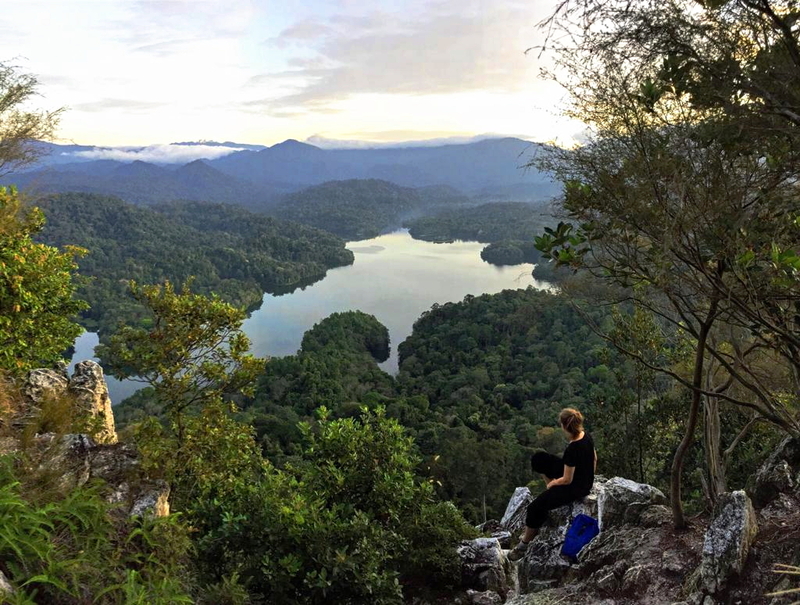 ** There are a couple of different trails, including Bukit Tabur West and East, but although the trail to the Western peak is easier, the views are said to be not nearly as good as from the Eastern peak. # Wear proper hiking shoes. # Take a head torch if you start in the dark. # Wear gloves to increase your grip and protect your hands. # Take plenty of water. Even when you hike early in the day, you will sweat a lot, and can easily dehydrate. # Hike in the morning to avoid the heat, and on a week day to avoid the weekend crowds. # Avoid hiking after it has rained, as the trail will become muddy and slippery. # Pay attention to your surroundings! It is a challenging hike, and there have been a number of fatalities. What an amazing experience. I’m so impressed. Thank you! The reward was definitely worth the effort. And what a surprise it was. I love your photos, especially the panoramic shots, the night time … they are real. That is what life is … not photoshopped. Not made to look unrealistic. As you say: steer clear of expectations. So true. I couldn’t have expressed it better. Expectations can often be unrealistic and crippling, and experiences are hardly ever the over-perfected versions people create or write about. Such a beautiful experience. So agree not to read too much about what to expect…it can spoil the possibility and experience. So true, Bev. I am so grateful I neglected the detailed research, because if I knew exactly what to expect, I wouldn’t have done it, and as a result I would have missed out on a very special experience. Good for you for persevering, Jolandi. It sounds and looks like a amazing experience. Thanks Tanja. I’m so glad I did. So awesome! I would love to do that hike! I totally agree with you on not obsessing over online reviews and descriptions. We recently did a “scary” hike in Hawaii that I had no plans of doing after I read the commentary online and saw the warning signs when we arrived. But I decided to just go partway to see, knowing I could turn around, and saw that it wasn’t that big a deal, so on we went. Of course, that’s the good kind of expectation crushing – where things turn out better than anticipated. The other kind – the ones where I expect luxury and safety and minimal effort and all kinds of wonderful things – are the killers because the only way to go is down! I completely agree, Lexie. I always try to limit my expectations, as they can really ruin an experience. That said, it really is hard to balance research and expectations. I’m so glad you enjoyed your challenging hike in Hawaii. I think you would love this hike, so if you ever find yourself in KL or transiting through there, you should contact Casey. You will not regret it. Thank you for ‘coming along’ on these adventures, Irene. Your pages are amazing, your story is easily understandable for all ages. I’ve loved all your stories and I was wondering if you would ever come to Europe and do some camping in the German woods. I often have these moments when I look at something old or made in a faraway place and I think about what it would be like to live their lives, and hear their stories, and am looking to start writing about my moments of brief lostness do you have any tips??? Thank you for your kind words, Quentin. The more I see of the world, the more I want to see and explore. Everyone has interesting stories to tell. Start telling yours. The best way to learn is to do. You will find your voice as you write and share, so don’t procrastinate. Simply start. Well done! Hiking with limited light is no fun. Something about being in the dark or semi darkness makes us skittish and doubt our every step.The views look amazing though – and yes, sometimes it is best that we don’t know what we are heading into. I, too, don’t like to read too many reviews or look at too many photos of a place before visiting. Thank you, Lani. I usually stay clear of anything involving adrenaline. But I do love mountains, walking and good views. So glad I did this. Great stuff! So glad that you did it. And I like what you say about expectations. They are the worst. Yip, they definitely are the worst. I think it is harder these days to avoid creating expectations as we are so bombarded with information. I definitely find that I have to work harder at it. And yes, I am also very glad I did this. Definitely one of my most memorable travel moments.